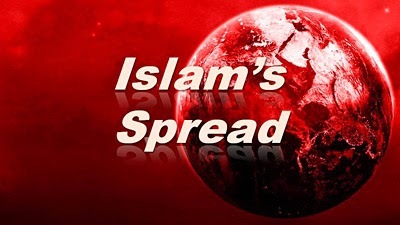 What is the secret behind Islam's rapid spread? In this study series on Islam, we will seek an answer to the question above. We will also explore Islam's background, belief system, goals, growth strategies and end time views. How Islam fits into the biblical description of the last days will be explored. And finally in the last segment, we'll look at the best methods for sharing the Gospel with Muslims. You can watch the video or listen to the podcast of the accompanying presentation by clicking the icons above. Let's look at how Islam has spread, and let me tell you, it has spread like wildfire. There are three main divisions in Islam. First, there are the Sunnis at about 80%. Sunni it means "the trodden path" or "tradition." They want to live a life in the pattern of Mohammad. They want to elect leaders. They follow the Islamic code very well. Second are the Shi'ites. They are a smaller group who long ago broke off because they felt that a descendent of Mohammad must be their leader. So, instead of an Imam like the Sunnis follow, the Shi'ites believe that authority goes through Mohammad's line alone. Third are the Sufis, which are the mystics. They believe God must be experienced. Those are the three largest groups. There are the Sunnis which are like the conservatives. There are the Shi'ites which are your ultra-orthodox conservatives. Then there's the Sufis who are like your hippie-liberals, if that helps you understand the groups. 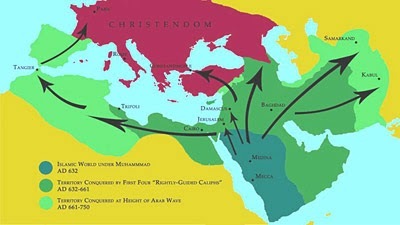 The following maps show how quickly Islam conquered the Middle East and Africa. After all, it's easy to conquer when you walk into a town with an army and say, "We will kill you unless you convert." 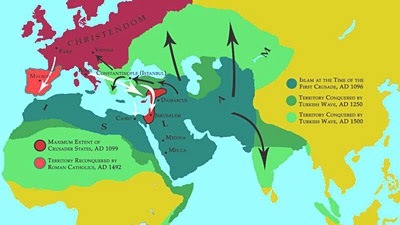 As a matter of fact, Islam spread so fast that they were on the doorsteps of France in 732 AD and in Vienna in 1529. Islam has constantly been trying to take Europe. The following video shows how Islam has been taking Europe today. I think it will be really eye-opening for you to see what's been going on right now in European countries today. This 2008 video was so effective that the Catholic Church held a special meeting to just to watch it and decide if they were losing the souls of Europe or not. It's gotten millions of views on YouTube. The content of the video is also transcribed below. According to research, in order for a culture to maintain itself for more than 25 years, there must be a fertility rate of 2.11 children per family. With anything less a culture will decline. Historically, no culture has ever reversed a 1.9 fertility rate. A rate of 1.3 is impossible to reverse because it would take 80 to 100 years to correct itself. And, there is no economic model that can sustain a culture during that time. In other words, if two sets of parents each have one child, there are half as many children as parents. If those children have one child, then there are a quarter as many grandchildren as grandparents. If only a million babies are born in 2006, it is hard to have 2 million adults enter the work force in 2026. As the population shrinks, so does the culture. As of 2007, the fertility rate in France was 1.8, England 1.6, Greece 1.3, Germany 1.3, Italy 1.2, Spain 1.1. Across the entire European Union of 31 countries, the fertility is a mere 1.38. Historical research tells us these numbers are impossible to reverse. In a matter of years, Europe as we know it will cease to exist. Yet, the population of Europe is not declining. Why? Immigration, Islamic immigration. Of all population growth in Europe since 1990, 90% has been Islamic immigration. France — 1.8 children per family. Muslims — 8.1. In southern France, traditionally one of the most populated church regions in the world, there are now more mosques than churches. 30% of children ages 20 and younger are Islamic. In the larger cities such as Nice, Marseille, and Paris, that numbers has grown to 45%. By 2027, 1 in 5 Frenchmen will be Muslim. In just 39 years, France will be an Islamic republic. In the last 30 years the Muslim population of Great Britain rose from 82,000 to 2.5 million, a 30 fold increase. There are over 1,000 mosques, many of them former churches. In the Netherlands, 50% of all newborns are Muslim. And, in only 15 years, half of the population of the Netherlands will be Muslim. In Russia there are over 23 million Muslims, that's 1 out of 5 Russians. 40% of the entire Russian army will be Islamic in just a few short years. Currently in Belgium, 25% of the population and 50% of all newborns are Muslim. The government of Belgium has stated that one-third of all European children will be born to Muslim families by 2025, just 17 years away. The German government, the first to talk about this publicly, recently released a statement saying, "The fall in the German population can no longer be stopped. Its downward spiral is no longer reversible. It will be a Muslim state by the year 2050." Muammar al-Qaddafi of Libya said, "There are signs that Allah will grant victory to Islam in Europe without swords, without guns, without conquest. We don't need terrorists. We don't need homicide bombers. The 50-plus million Muslims in Europe will turn it into a Muslim continent within a few decades." There are currently 52 million Muslims in Europe. The German government said that number is expected to double in the next 20 years to 104 million. Closer to home, the numbers tells a similar story. Right now Canada's fertility rate is 1.6, nearly a full point below what it is required to sustain a culture. And, Islam is now the fastest growing religion [there]. Between 2001 and 2006, Canada's population increased by 1.6 million, 1.2 of those immigration. In the United States, the current fertility rate of American citizens is 1.6. With the influx of the Latino nation, the rate increases to 2.11 — the bare minimum required to sustain a culture. In 1970, there were 100,000 Muslims in America. Today, there are over 9 million. The world is changing. It's time to wake up. Three years ago, a meeting of 24 Islamic organizations was held in Chicago. The transcripts of that meeting showed in detail their plans to evangelize America through journalism, politics, education and more. They said, "We must prepare ourselves for the reality that in 30 years there will be 50 million Muslims living in America." The world that we live in is not the world in which our children and grandchildren will live in. The Catholic Church recently reported that Islam has just surpassed their membership numbers. Some studies show that at Islam's current rate of growth in 5-7 years it will be the dominant religion of the world. As believers we call upon you to join the effort to share the Gospel message with the changing world. This is a call to action. In the seventh segment of this study on the fall of Islam, we'll study the two main tactics behind Islam's fight. Here is something I do not understand after viewing this video. If the anti-christ is not a muslim, yet the world majority (or controlling minority) will be muslim, then how can the a/c possibly gain control of the world? Just have to comment briefly (off topic). Just watched some videos of Billy Graham and he with his own words denies that Jesus is the ONLY way to salvation. He said you can be saved without knowing Jesus, even through the muslim religion, since, as he said, God is calling everyone to salvation but not necessarily through Christianity alone. Never knew this. If other didn't either, you should. Billy Graham is NOT someone to be listened to. Hi billy! I am blown away by what u said about billy Graham! YIKES! Is that a sermon or an interview? Or where did you hear him say that!? HI BILLIE JUST SAW YOUR COMMENT ABOUT BILLY GRAHAMN I TOO AM WONDERING WHERE YOU HEARD THIS I WOULD LIKE TO HEAR FOR MYSELF.CAN YOU BE MORE SPECIFIC ON THIS TOPIC.THIS IS NOT GOOD NEWS TO HEAR ABOUT BILLY GRAHAM I AM WITH SUSIE YESHUA HELP US ON THIS. Billy, I'll address Islam's future in the end times later in this series. Dr. Reagan's article Are There Many Roads to God? under the sub-heading "A Controversial Statement" has his response to Billy Graham's statement. Just read the Dr. Reagan link to the Billy Graham statement. There is a clarification, thank goodness, because his statement on the surface is as I described. It sounds like, from what I read in the Dr. Reagan article, Graham just did not choose his words clearly and the meaning therefore did not translate clearly. I believe this is the case. I recently watched a Billy Graham message program on TV and he stressed Jesus and Jesus only, no "other way to God" was mentioned. I apologize if I added to this confusiion re: Billy Graham based on his statement and regret adding to any disinformation. I hope to be forgiven for my take, though it was understandable I felt this, as many others did, I see one should always research further before drawing permanent conclusions. On the other hand, if I hadn't posted my comment, I would have never known the whole picture.